Action from City of Peterborough seconds (red) and Bourne Deeping firsts in the East Premier B Division. Photo: David Lowndes. The National League is being re-structured in the summer, with regional Division Ones being added to the competition. Action from City of Peterborough seconds (red) win over Bourne Deeping firsts. Photo: David Lowndes. If City finish in the top six of the East Conference they will be placed in a second tier division next season and that is their aim. They are currently ninth, but just two points off sixth place. A 2-2 draw at top dogs Old Georgians - a star studded team full of current and former internationals - has certainly boosted their chances ahead of the last two matches of the season, winnable contests at home against Old Loughtonians (March 24, 1pm) and away to Cambridge City, the two other teams in the bottom three. City manager Graham Finding said: “With highly winnable fixtures it is feasible that we could reach a points total of 21, and with it perhaps a top six finish, and Division One hockey next year. “There are so many teams in the running with a multitude of possible points tallies that the final table remains impossible to predict, but whatever happens our chance of success will run to the final game of the season. Action from a 4-3 win for City of Peterborough seconds over Bourne Deeping firsts. Photo: David Lowndes. The East League will also be restructuring in the close season and City seconds will be promoted to the Premier Division after beating local rivals Bourne Deeping 4-3 in a thrilling Premier B Division game at Bretton Gate on Saturday. Will Astbury, Zac Scotting, Paul Hillsdon and Nathan Foad scored for City. 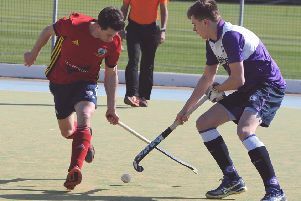 Spalding thirds confirmed their promotion from Div 4 Four North West with a closely-fought victory over Cambridge Nomads. 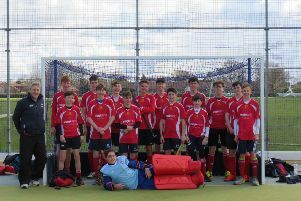 Ben Scholes’ two goals proved enough in a 2-1 win as Spalding sealed second place. City of Peterborough Ladies pushed second-placed Chelmsford hard in their penultimate East Premier Division game before accepting a 4-2 defeat at Bretton Gate. Anna Faux and Leah Goodley scored for City who finish their season at Canterbury seconds on Saturday. Captain Chelsea Oldham claimed the winning goal for champions City seconds in their 1-0 success over Bourne Deeping in Division Two North West. Oldham scored from the penalty spot and saw a second penalty saved later in the game. Bourne Deeping are the only team to take points off City this season. City thirds went down 5-0 at Division Three North West champions Saffron Walden, a team who have won all 21 matches and who now have a goal difference of +187!